Benjamin W. Waber and Alex “Sandy” Pentland of the MIT Media Lab recently used RFID and Bluetooth tracking devices engineered as sociometric badges to study the patterns of communication among employees at two different companies. The second company was a call center for Bank of America. After a few weeks, the research data indicated that customer service representatives who talked to more co-workers were getting through calls faster, felt less stressed, and had the same approval ratings as their peers. “Informally talking out problems and solutions, it seemed, produced better results than following the employee handbook or obeying managers’ e-mailed instructions.” The MIT research findings shouldn’t surprise us since numerous psychological experiments show that people are reluctant to share uncertain or sensitive information in formal meetings, especially when they think they alone possess it. One simple intervention is to give workers more opportunities to socialize in groups. Currently we are implementing a strategy at a call center for a national bank chain where we are changing the break structure of the employees. Previously each employee on a team of around 20 people had a separate 15 minute break in order to reduce the need to shift call loads to other teams, although in practice this issue is not terribly important. This makes it very difficult for cohesive relationships to develop, since groups of friends will by design have limited opportunities for shared interactions. To create more of these opportunities we changed the break structure of two of the four teams that we had studied previously so that all of the employees on a team are given a break at the exact same time. 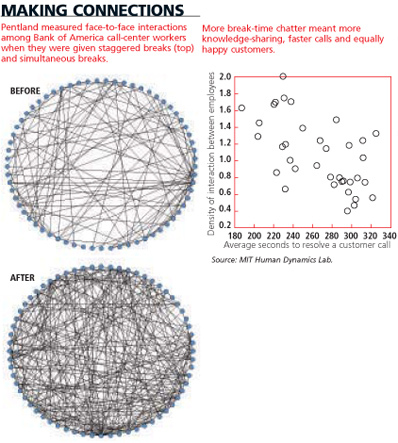 The patterns of social interaction changed dramatically after the intervention, and Bank of America reported productivity gains worth about $15 million a year. So, what do these findings indicate about the importance of social networks in collaboration and performance for distributed teams? …we’ve begun tracking employee relationships. When employees log in to their computers, we ask them to look at a picture of a random employee and then ask them how well they know that person — the options include “say hi in the halls,” “hang out outside of work,” and “we’re going to be longtime friends.” We’re starting to keep track of the number and strength of cross-departmental relationships — and we’re planning a class on the topic. My hope is that we can have more employees who plan to be close friends. The key fact behind the Zappos example is that using social networking as part of business design is a way of cultivating shared experience among employees rather than a mere means to an end, or goal, alone. Achieving the latter is in fact, as the research above indicates, increased by cultivating shared experience through social relationships. No doubt, developing such shared experience among members of distributed teams takes longer than it does when employees meet in the hallway or on breaks. Nevertheless, shared experience, not just shared information, is fundamental to the social networks underlying collaboration and community. Many, if not most, employees don’t only need to get to know one another through reputational systems, like who tags whom or rates them as possessing expertise. Comfort with one another is needed to develop a shared experience where trust increases the likelihood that needed information is shared, or that the need itself is anticipated. This simple fact about people is too often overlooked. This entry was posted on Sunday, August 15th, 2010 at 12:48 am and is filed under Change Management, Collaboration, e-Learning 2.0, Learning Experience, Social Business Design, Social CRM, Social Media, Social Networks. You can follow any responses to this entry through the RSS 2.0 feed. You can leave a response, or trackback from your own site. These are some powerful insights. Do you have any thoughts on how to facilitate friendships in a distributed teams? Thanks Avdi and yes I do have thoughts on facilitating friendships in distributed teams. I first wrote about it a few years ago in a book chapter titled The Limits of Anytime, Anywhere Customer Support: Distributed Work and Home-Based Agents in the Handbook of Research on Electronic Collaboration and Organizational Synergy (eds.) Salmons, Janet and Wilson, Lynn. IGI Global. (2008). Since then I’ve developed my thinking in this area substantially. I plan to post a couple of blog entries on the topic over the next few months. In fact when someone doesn’t understand after that its up to other users that they will assist, so here it happens.